IBEC will participate at Symbiosis, the 14th European Congress on Biotechnology, one of the largest and most relevant events of Biotechnology in Europe. This congress is organised every 2 years by the European Federation of Biotechnology (EFB) in Barcelona. The IBEC Director, Prof Josep A. Planell, will be addressing the conference audience on Tuesday 15th September to explain the Institute´s mission and scientific programme. 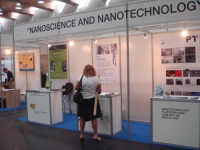 From 7th to 11th September, Barcelona will host the Trends in Nanotechnology (TNT) 2009 conference. This high-level scientific meeting provides a broad insight into top level research in all the areas of nanoscience and nanotechnology, as well as information to the nano community on related policy, regulation and networking initiatives, organised into a series of specific sessions. Tsukuba, Japan. On 24th of July NIMS (National Institute for Materials Science) of Japan, and IBEC (Institute for Bioengineering of Catalonia) signed a Memorandum of Understanding (MoU) for collaboration on the “Design of Biomaterials Surfaces and Biosensors for Cell Function Manipulation and Analysis”. The first cover of a top nano-science journal this month features the work of several IBEC researchers. The journal Small (Volume 5. No. 11 – June 5 2009) dedicates its cover to a paper published by four researchers from IBEC´s BioNanoPhotonics group led by Dra. María García-Parajo and two scientists from the Nijmegen Center for Molecular Life Sciences (NCMLS), in the Netherlands. Members of IBEC International Scientific Committee and the directors of the Institute held their annual meeting, to follow up on the scientific activities developed by the fourteen lines of research that operate in the centre. Scientists from Europe and the United States gathered at the World Trade Center in Barcelona for the 2nd Annual Symposium of the Institute of Bioengineering of Catalonia, and presented details of their most recent research work in the areas of bioengineering and nanomedicine. Scientists from Europe and the United States will gather at the World Trade Center in Barcelona for the Second Annual Symposium of the Institute for Bioengineering of Catalonia, to present details of their most recent research projects in the fields of bioengineering and nanomedicine. Dr. Mina Bissell, from the Life Division Lawrence Berkeley National Laboratory, in California, will be the speaker at a special IBEC Seminar organised for this coming Wednesday 25th March, on the theme of “Tissue Architecture is the message: The role of extracellular matrix and organ architecture”.